Adoration of the Magi - Botticelli tapestry shows the Christ child visited by the three wise men or magi, the work of Sandro Botticelli. An early renaissance painter, Botticelli (1445-1510) produced works which were in the Florentine school of art. In this work, we see a magnificent scene where villagers are gathering to witness the gifting of gold, frankincense, and myrrh to the stable scene in the centre. The garments of the people are beautifully rendered in a variety of colors to evoke a sense of celebration in this scene. Green hills are seen to extend into the background. His works are a balance of the devout and decorative. 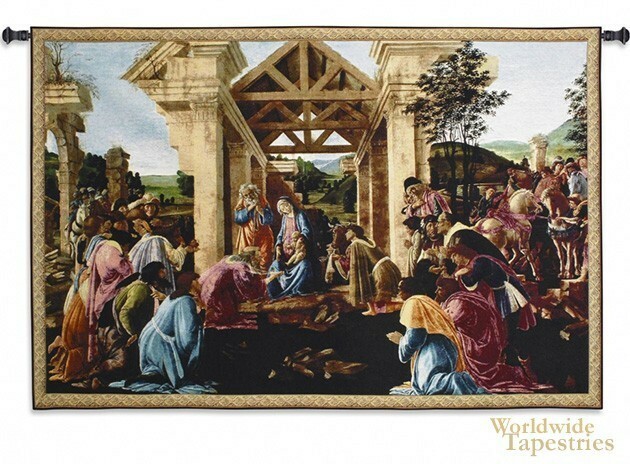 Adoration of the Magi - Botticelli tapestry is backed with lining and tunnel for easy hanging. Note: tapestry rod and tassels, where pictured, are not included in the price. Dimensions: W 63" x H 41"